Manufactured to European Standard EN131, industrial use (also NF and GS Standards). Extra width - easier to climb, greater stability. Back section extends - safer operator descent. Fitted with wall runner wheels. Comfortably reaching an area while working at height is important, it allows the user to concentrate on what they are doing. This two section push up ladder has extra width which makes it easier to climb, even at a great height and it also gives the ladder greater stability. The back section also extends to ensure that it safer for the user to climb up and down the ladder. The square rungs with a flat top ensure that you have added grip and comfort when using the ladder and for added safety this product has rubber feet at both ends. 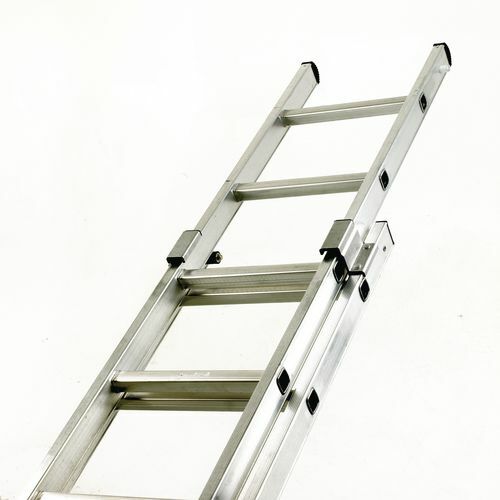 This ladder is fitted with wall runner wheels, and for your peace of mind, it is manufactured to European Standard EN131, industrial use. They are available in six extended heights; 4.02, 4.86, 6.06, 7.18, 8.31 or 9.43m. Our industrial use box section aluminium ladders are a great way to reach high up areas. They come with a 60 month guarantee and FREE UK Delivery.